Buzzing around from day to day and project to project, I feel like there is no time to read, to relax, to create, or to write. With our recent move, we’ve had so much to do with unpacking and reorganizing, while continuing to work , but I get a little frustrated with myself because I can’t seem to get it done as quickly as I’d like. I have so many ideas I want to incorporate to get my office organized and my work files set up so that I am ready to dive into my next project. Instead, I continue to scrounge for files and paperwork and look forward to when everything is more organized. Simply put, I am challenged by disorder, and I often don’t feel like I can stop working until everything is in its place. The thing is, I know unpacking after a move takes time. And we really have made pretty good progress. The large pile of boxes has diminished, I know where to find most of our stuff, I’ve completed some work deadlines and am getting prepped for upcoming projects, and, the truth is, this new place is already beginning to feel like home. I just need to keep reminding myself that there is time for everything that must be done. And it will get done, eventually. But I also realized that sometimes I need to forget about all the things that should be done and actually make or schedule time for the things that really matter to me – like writing, making crafts, and capturing images with my camera. I also need to try not to get so caught up in doing that I miss out on the chance to experience simply being. Luckily, our new home makes that more possible than ever. 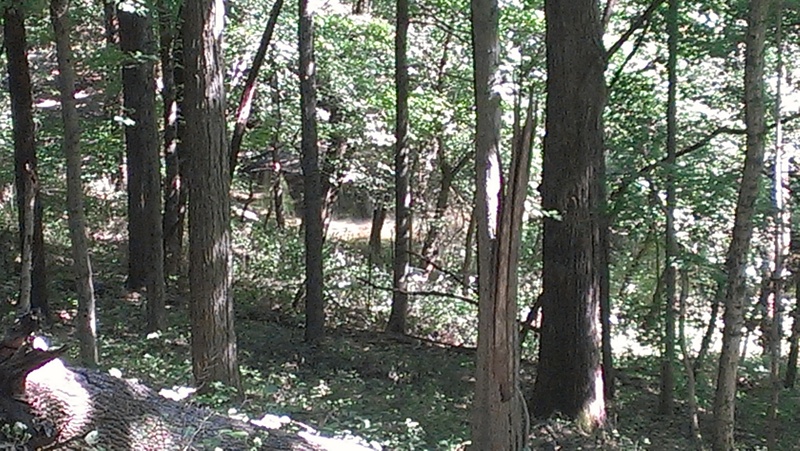 Behind our house, we have a wooded area that slopes down to a small creek. This creates a wonderful atmosphere for slowing down, relaxing, and breathing in the peace and tranquility of nature. Every day, Bart and I go out on our deck either in the morning or the evening (or both); we enjoy the breeze rustling through the leaves, and we watch the woods for wildlife. 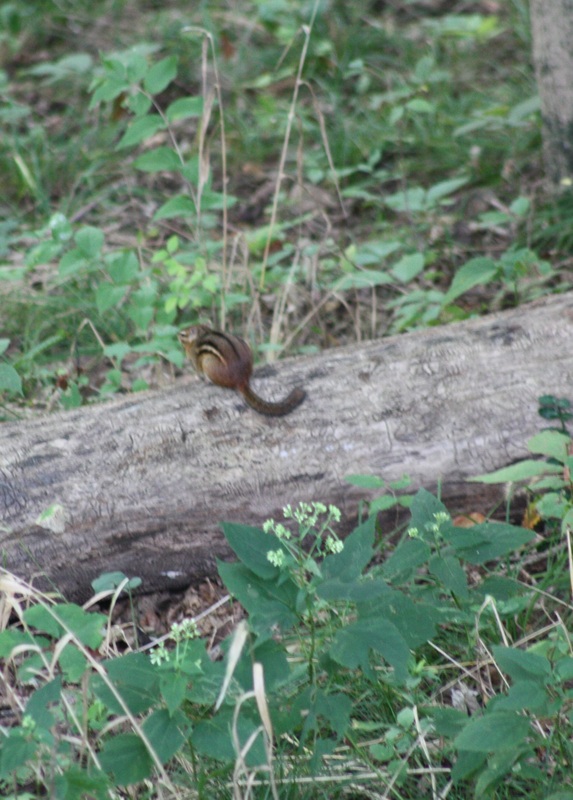 So far, we’ve seen deer, woodpeckers, chickadees, squirrels, and a chipmunk. Sometimes I bring out my camera to take photos. Other times, I try to simply live in the moment and enjoy the experience. Watching wildlife, for us, is fun and relaxing; it somehow makes me feel more a part of creation rather than a cog in an industry wheel that is turning and turning and going nowhere. That’s what I begin to feel like when I let “all work and no play” become my focus. To encourage our wildlife friends to come around, we recently put up a deer feeder, a bird feeder (in the front and back yards), and a hummingbird feeder right outside my office window. I’ve had the joy of seeing hummingbirds drinking from the feeder right outside my window for the last few days. It’s so cool to be working and then peripherally catch sight of somthing zipping around outside. 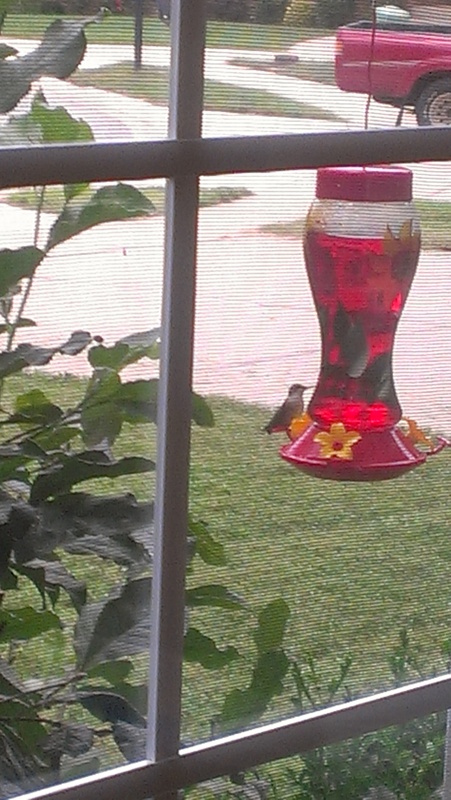 Watching the hummingbird drink the “nectar” always causes me to pause and smile. It sort of creates a bunch of mini-breaks in my day. When I saw the first bird or two, I took a few photos with my phone, and I keep wanting to get out there with my telephoto lens to get some really good shots. Once again, though, I have to remind myself, it’s okay to just enjoy the scenery. I don’t always need to be in pursuit of the next awe-inspiring image. It’s funny how such a quick bird is helping to teach me that it’s okay to slow down. Anyway, right now, I have a little work to do, but soon enough (next week to be exact), I will be taking a vacation and I promise not to think about boxes or work or “to do” lists. I will simply enjoy the magical experience of Hawaii with my wonderful husband who earned the trip through his own hard work and diligence. Of course, I’ll take lots of photos too though, and I’ll be sure to share some of them later. 🙂 Aloha, my friends!